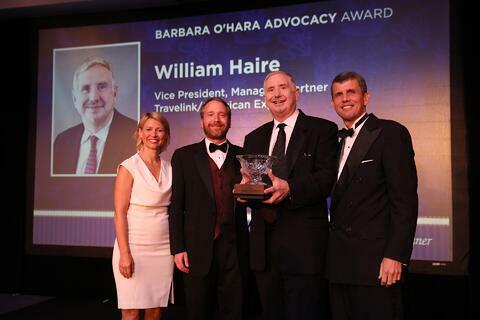 Travelink, American Express Travel, is pleased to announce Vice President and Managing Partner, William Haire, has been awarded the Barbara O’Hara Advocacy Award. Regarding the award, Haire accounts, "The Travel Advisor is key to helping the consumer navigate the myriad of options and suppliers in the travel industry today. We advocate for all agencies and agents on the federal and local level to make sure the consumer is treated fairly without additional indirect taxes being leveled." Pictured left to right: Samantha Brown, Canadian Travel Blogger; Eben Peck, Senior Vice President, Government & Public Affairs, American Society of Travel Agents (ASTA); Bill Haire, Vice President, Managing Partner, Travelink, American Express Travel; Michael Hanson, Senior Director / Government & External Affairs, Sabre.